Radon Testing CT: How to Prevent Radon. Radon gas in Connecticut can be prevented with radon mitigation systems. These systems are like a vacuum for the soil under your home. They are installed by certified radon remediation professionals and are become permanent components of your home. They are comprised of suction pipes that enter the soil under the concrete floor or a crawl space vapor barrier, a radon fan, and an exhaust pipe to vent the radon gas out into the atmosphere above the home. 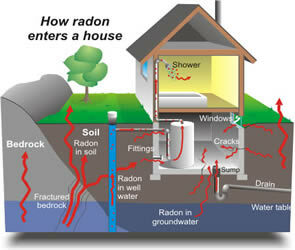 They run continuously to grab the radon from the soil before it can enter the your home home. One of the speakers at a radon convention in Utah, found out he had lung cancer and has never been around a cigarette in his life. His story of survival is amazing. His advocacy to test for and prevent radon continues to increase radon awareness. An oncologist who specializes in lung cancer research was also at the convention. He mentioned that lungs of growing children are developing at a higher rate than adult lungs. Could these cells that are constantly dividing be more vulnerable to radon gas? Across the country, more and more people are taking action to reduce radon in their homes. Many states are beginning to pass laws to build homes with radon resistant features. Recently, the EPA announced the Federal Radon Action Plan, which “aims to reach 860,000 homes, schools and daycare facilities in 2013. Call us today to schedule radon testing on your CT home or property 888-558-1574.